The little Mercedes-Benz 190E remains one of the most well-built cars of the modern age. Dependable? Certainly. Fast? Not so much, unless you spring for a Cosworth or something. That is, unless you drop a big-turbo LS into the front of it. 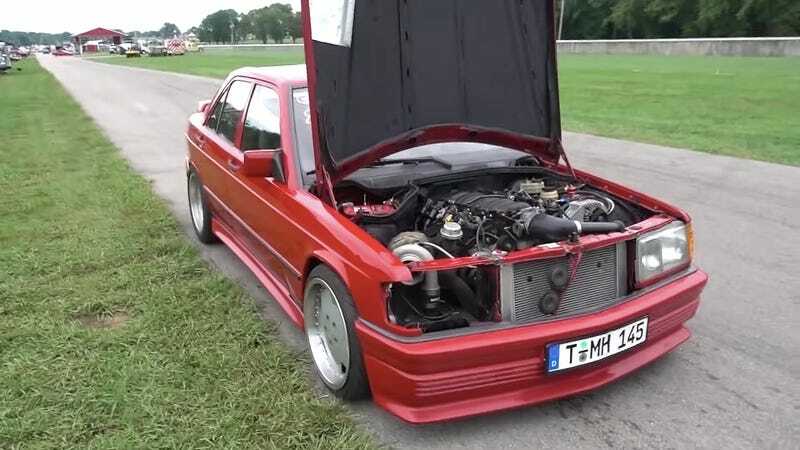 This GM engineer picked up this grey-import 1984 190E with a lovely period-appropriate Zender body kit and wisely assessed that if it was going to be fast, a turbo LS was probably not the worst way to go. The sound is like an AMG that never was. The car supposedly runs quarter miles in the 12s, which is fast as hell, though the owner wants more speed. I’m just impressed at how clean the thing is, and how right it feels. These chassis are still cheap, right? Why The Hell Is This Mercedes 190E Ten Times The Price Of A BMW E30 M3?